This year students will particpate in two different reading blocks. First thing in the morning (If your child is tardy they will miss out! :-)) students will particpate in guided reading. During this time students will be in a small group getting specific reading support from myself or another teacher. Directly after students will participate in core reading where they will learn and practice a variety of reading standards. Students will also particpate in 30 minutes of Independent Reading time. Your child might apply what they learned this morning, read silently and independently, or choose an iPad and log in to Lexia Core 5, my favorite language arts app. 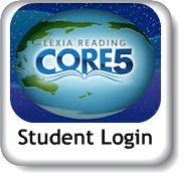 Click the Core 5 button above to go directly to Lexia Core 5. JCPL and Jessamine County Schools work closely together. I encourage you to visit the library, check out some great books and see what all the library has to offer. You can also click on the image above to go to the JCPL website. If you click on Children's Library and mouse over you will see a list of options that may be of use to you and your child. One of those options is Tumble Books. Tumble Books will read stories (fiction and nonfiction) to your child. You can also take a quiz and/or play a game about the story when finished. Tumble Books is linked to the common core ELA standards that are required for first and other grades. I encourage you to check this out! Your child will love it.